Pick your essential products you need every day. 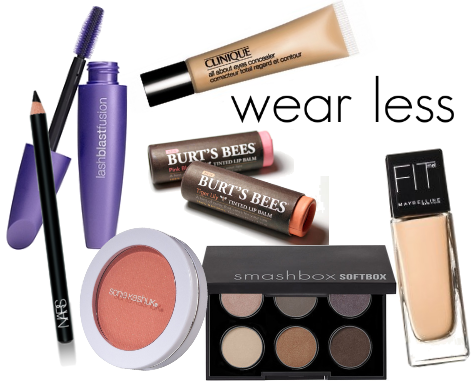 Try to limit your essentials to three or less products. My essential is definitely concealer. When I get dark circles around my eyes or break outs, I like to have my concealer on hand to make my imperfections look a little less noticable. My close second pick is mascara, but I do want to give my eyelashes a rest sometimes. It's important to both moisturize and protect your face from sunscreen. If you like wearing foundation, get double action by wearing a tinted moisturizer or SPF instead and cut down on your makeup use. It's amazing how just one product can take your face from just-woke-up to fresh and natural. Want to show off your glowing skin today? Brush on some blush and perhaps a little mascara, and you're good to go. Lips look kissable? Swipe on a bit of tinted lip balm and leave the rest off. Want your eyes to pop? Try just eyeliner and mascara to be the focus of your face. Remember, it's definitely not a bad thing to put on a full face of makeup once in a while. Makeup in moderation is the key! What do you think? Would you wear less make up than you do now?